Surfing began in Cuba in the 1990's, in the neighborhood of Miramar, a western district of Havana. It was in those early days that two Chileans were first seen grabbing a few waves to a astonished crowd of onlookers at a beach called “Playita de 12” also call "los Yaquis" for Jacks for the old childhood game due the shape of the breakwaters there,. It was said that the Chileans would show up at the beach whenever a cold front (northerner) would be forecasted. The two would surf aggressively over the reef that was about 50 meters along the Miramar shoreline. Young people in the neighborhood would come to observe this “amazing feat” as demonstrated by these skilled Chilean colleagues, and from this first demonstration, directly led to a handful of teens (the most active and brave of these early Cuban watermen) to head into the water with pieces of wood they called "pleybo" (plywood) to try to mimic the foreigners and try their best to surf the waves, some upwards of 12 feet. Surfing and bodyboarding were becoming increasingly popular; it was not unusual to catch a few early surfers anxious for the next cold front to hit. These early and humble surfing ventures were primitive at best, dropping into a wave on a rough shaped plywood with no fins added with the challenge of doing so only feet away from some of the narliest reefs around - extreme conditions witnessed in disbelief by many neighborhood onlookers from the shore. By the late 90's and beginning of the new millennium, the sport began to take on a more modern appearance and expanding beyond that initial Miramar beach, to over eight other breaks further to the west and including three others closer to the center of Havana. Young men and women of distinction began to emerge who not only shared a passion for waves, yearning for knowledge, but a desire to take the sport to a new level. This groundswell of enthusiasm resulted in a grass roots approach to “coger olas” (aka catching waves) and to the growth of the modernized version of the sport within Cuba. Early surfers like Joan, El Tito, Borroto, El Fide, Humbertico (one of the best surfers of Cuba), El Jompy (Juan Pedro), Yuniel, and many others, to numerous to name, were the true early pioneers of surf in Cuba. This passion drove them to create an entirely indigenous surf manufacturing operation using the materials at hand. These kids were as creative as the earlier generation had been in keeping the old American cars running. Using materials scavenged from boat repair yards and junkyards the early shapers began making surfboards and bodyboards from ship building materials, broken down refrigerators, and foam that would occasionally wash up on shore. Tito, Jompy and Guajiro (Wa-heero) were some of the earliest "shapers" to make a name for themselves. Tito manufactured one of the earliest Cuban fiberglass bodyboards resembling a boogie board without fins. Jompy took this a step further building surfboards from refrigerator foam using templates taken from surfboards that were being left behind by tourists. Jompy would rough out the shape, finish it by hand tools and glass using boating cloth and resin. Fast forward a few years and Guajiro started manufacturing more modern type surfboards using traditional materials (foam, glass and resin) donated by visiting surfers that heard of the absence of materials. What is impressive is that these early shapers produced rustic yet usable boards notwithstanding the lack of materials while working under very primitive conditions with rudimentary tools. Sadly, the situation in Cuba has gotten worse throughout the decade and today it has gotten quite difficult to find the raw material for manufacturing surfboards and consequently it’s almost impossible to find a Cuban made surfboard anymore. These early surfboards and bodyboards were being sold for $50 USD to $150 USD respectively, boards that could only be purchased by the fewest of surfers who worked and scrapped enough change to purchase these prohibitively expensive boards. Cost of these boards was equivalent to one to three months salary for an average working person. Surfing began to gain popularity in the high schools in Miramar, especially at the "Marcelo Salado" High School a school dedicated to competitive aquatic sports. As a student of the school, Louis Manuel Mazorra, (nicknamed Luisma and founder of CubaSurf) together with his older friend Felix went to check out the beach as the waves were pumping one day. Luisma recalls that in those days, he knew little of surfing, but heard of surfers riding massive waves in places like Hawaii. His early exposure to surf was as a child bodysurfing whenever the families would vacation at the beaches of Varadero in relatively calm waters. Those summers of playing on the beach amongst the waves would leave a lasting impression these boys. That winter day when Luisma and Felix stepped on the sand was to change everything. Big waves were hitting Cuba’s north shore hard and there was a testosterone-backed buzz of youngsters ready to brave them. “Playita de 12” had overhead waves breaking over a formidable reef. With about 10 other boys already in the water, all with clear differences of competency, their initial bravado waned as they sat there standing before breaking waves face-on. Despite this, it was clear that they could not back down given the number of onlookers egging them on to go out. Emboldened by the taunting and their swimming proficiency they eventually shrugged stating, “Hey, I’m a very good swimmer, what could possibly happen to me?” and the boys decide to hit the waves straight away. On the swim out through a keyhole channel, Felix, a veteran of some early thrashing, provided brief instructions on how to get out; but the meager instructions never included anything about what do when one was to grab any of those enormous waves. The boys neither had proper equipment, rash guards, or leashes, except for Luisma who had a battered piece of plywood that they found floating amongst the rocks earlier. That big day turned out to be awful for the boys as most of the time they spent involved fighting current and whitewater, doing a number on their egos. Eventually, each boy got a chance paddle into a wave, throw caution to the wind, and once on the face of the wave, charging directly towards the gnarly “dog tooth” coral, a target that both instilled fear yet gave birth to a passion for surf and the sea. Though these boys didn’t quite know it, that stormy day not only generated plenty of fear and exhilaration, but also gave birth to a life-long love for the ocean and surfing. Luisma commented later that the plywood board he found and used that day was coincidentally painted with the same color of blue that was used on the desks at the swim school. And it turned out that he was right! Those old school desks continued to be the source of surfboard and bodyboard equipment that the kids used to hone their early surf skills. These experiences attracted a lot of interest amongst the classmates as they recounted the harrowing experiences, fear and euphoria they all felt that day. Consequently, a close nit group of friends started a journey – one that would eventually develop a local surfing community. And unlike their earlier experiences of viewing foreigners from afar, they would eventually develop the experience, equipment and tricks, to surf virtually any break or wave depending on the situation. A trip to the beach now had new meaning and they were enthralled by it all. These groms eventually began acquiring their own “real” surfboards and bodyboards; those that couldn’t, would resort to their old wooden desktop versions; and forming small groups of rookies. The winter of 2005 was a good one for surf in Cuba as every week brought a new winter storm and with it big surf that would have kids borrowing equipment or reaching for any available plywood to join their friends. Luisma got his first real surfboard that year which was imported from Brazil, which he happily traded his prized skateboard and bodyboard, and with that new equipment, his passion grew more than ever as did his skills. As their enthusiasm grew exponentially, so did it drive the kids’ mothers and teachers crazy. To them going out during a winter tempest was irresponsible, suicidal and sheer lunacy. As there was no way to convince them otherwise, they resorted to coming up with little white lies every time the surf was up and storing the boards where no one could observe them going out to surf. By 2007, Cuba had more than 300 surfers with many more breaks identified and popularized throughout Havana, including beaches in the north eastern provinces of Cuba which faced unobstructed by the Bahamas the open Atlantic Ocean swells. During that same year, surf cinematographer Taylor Steele and professional surfer Ozzie Wright traveled to Cuba to film the surf film “Sipping Jetstreams” (http://www.youtube.com/). This event, as can be imagined, created a huge buzz in Cuba. It was the first time they had ever met a professional surfer and consequently followed him like a rock star. They were in awe as Ozzie went through his repertoire of tricks; floaters, snaps, aerials, 360’s - things that they thought impossible, and what’s more, the experience left them certain that surfing could and would grow in Cuba. In 2009, a group of young surfers and college students decide to create a national surfing organization in Cuba named CubaSurf. www.cubasurf.caThe founding group included Massiel Nasser (photographer), Liset Campos (video camera), Oliver Gell, Camilo, Kevin Gell, Humberto, Arnan, Mamekto, all the boys in Santa Fe that formed the Surfing Oeste surf team and Luis Manuel Mazorra as lead and founder. The biggest surf event to finally reach Cuba was realized thanks to the PASA (Pan American Surf Association) and surfers Ametza Nicholls (Barbados), Icah Wilmot (Jamaica), Junior Edwin Gomez and Ten both Dominicans. In early 2010, surf seminars led by Marcos Conde, coach of the Brazil surf team, provided much needed education for the Cuban surfers to learn about surfing competitions, techniques, championship rules, etiquette and many other things related to surfing. Throughout 2010, thanks to the promotion of CubaSurf and their website, the group received a number of timely donations from foreign supporters. Donations received included: Chile (Daniela), Brazil (Mercosur Chamber of Commerce), Canada and Japan from our friend and collaborator Herb Silio. Cuba’s first competitive surf team, called the Surfing Oeste (West Surfing) Team sponsored by CubaSurf was founded to support young surfers (groms) ages 12 to 18 to further the future of surfing in Cuba. The few boards and equipment that these kids have are a direct result of the donations received and the shared “aloha” that permeates the worldwide surfing community. Throughout 2010, a number of surf trips were planned and executed for the first time in Cuba. This early surf tourism would take over a hundred visiting surfers touring from one beach to another to share waves, supported by photographers and cameramen documenting the early success. Examples of these surf trips are shown on the CubaSurf website and Facebook pages, shared regularly with many online visitors from around the world. CubaSurf members provided numerous free surfing lessons to local kids throughout the country. They assisted with much of the Cuba-based PASA-sponsored surf competition, planned and conducted surf trips to undiscovered surf spots throughout Cuba. All the while, welcoming visiting surfers with raw enthusiasm that is rarely seen these days. CubaSurf’s main objective is to advance the sport on the island and its members and founders, have much to be proud of for their early pioneering work. With over 2,300 miles of beaches, Cuba is a true wonder to behold and is capable of providing world-class venues for international surfing, bodyboarding, kitesurfing, standup paddle competitions as well as openness for surfing tourism. Despite all the economic and political problems that exist in Cuba, it is clear that this new generation is working hard to develop the sport of surfing as well as the infrastructure needed to promote and expand the sport for future generations. When Hot Curl surfboards were developed on O‘ahu, toward the end of the 1930s, Whitey erroneously adopted the design for California waves. 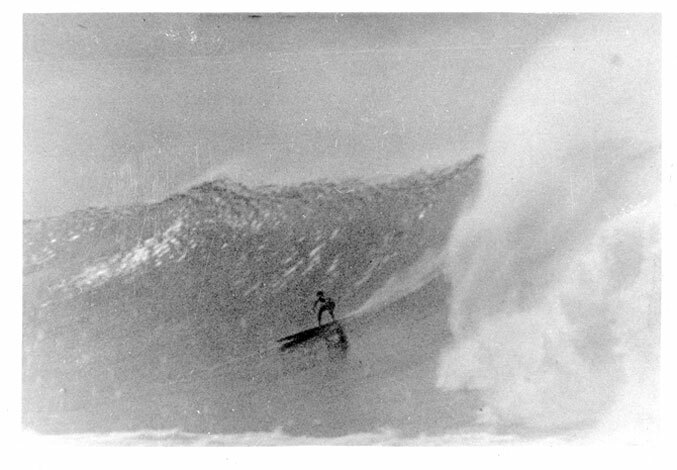 “A lot of guys – like Whitey Harrison – when they came down and saw what our boards could do at Castle – him and Pete Peterson cut their tails down – right there on goddamn Waikiki Beach!” Hot Curl surfer Wally Froiseth told me. “They cut their tails down. Of course, when they went back to the Coast, they took their boards with ‘em.” Unfortunately, the Hot Curl design, while working well for larger reef and point surf in Hawai‘i, failed miserably in the relatively smaller surf of predominantly beach-break Southern California. Lorrin surfed O‘ahu most every year during the 1930s and was one of the small group of surfers who helped expand surfing’s Hawaiian boundaries out beyond Waikiki. Even as early as the winter of 1932-33, he had witnessed big surf on the North Shore, at Hale‘iwa. Later on in the decade, as a friend of Hot Curl surfers like Wally Froiseth, Fran Heath and John Kelly, Whitey not only rode the biggest waves O‘ahu’s South Shore had to offer, but branched out to the North Shore. Old timers generally credit Whitey and another Mainlander – Gene “Tarzan” Smith – as the guys who first “rediscovered” the North Shore as a surfing area, in 1938. Paumalu – now known as Sunset Beach – is a spot on the North Shore noted for excellent surf both in the modern era in the times of the ancient Hawaiian legends. It is likely that the North Shore of O‘ahu has always been ridden at one time or another – at least since the first Polynesian settlers made their home in the Hawaiian Chain. Unnamed surfers must have been surfing the area, if only on and off, all the way through. We know that guys like Andrew Anderson were living at Mokule‘ia and surfing there in the 1920s and ‘30s. But, in relationship to the surfing movement of the Twentieth Century, it wasn’t until Whitey and Tarzan made the call that the North Shore was put on the surfing map. “This is the way it happened with us,” Wally Froiseth told me. “Whitey Harrison – he and Gene Smith went out to Hale‘iwa one day. This was, like, around ‘37 or ‘38, whatever it was. They went out to Hale‘iwa. It was a big day. And they both almost drowned. “Me and my gang [the Hot Curl riders], we hear that – ‘Hey, let’s go!’ So, the next weekend we go out there, you know, but Hale‘iwa wasn’t that good, but Sunset Beach was good, so we just went Sunset. “Who started going out to the North Shore?” I prodded. Soon afterward, World War II took over the life of the planet. Amongst other things, the war put surfing in a kind of suspended animation. 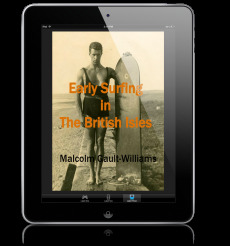 There were guys surfing when they could, but most everyone was involved in the war effort on some level and the war took everyone’s time – one way or the other. After the war, board experimentation and manufacture continued its shift from Waikiki to Southern California. Materials-wise, besides the addition of balsa, the innovation of the skeg and the introduction of new materials like fiberglass helped propel development. As far as shaping was concerned, the scoop nose and use of rocker had long term effects on improving board design. Whitey and Cecilia raised their family in the Yorba family’s historic 200-year-old adobe in San Juan Capistrano. The adjacent “Lorrin’s Barn” – built around 1890 – became an important Southern California “research and development center” for experimentation with various watercraft during the decade and more after the war. Experimental designs covered a broad range of equipment, included diving gear, paddle boards and outrigger canoes, as well as surfboards. “When I came here [to Capistrano beach] we kept horses in [the barn] for the kids,” Whitey recalled. Later on in the 1950s, polyurethane foam surfboards would have their beginnings here and in the workshop of Dave Sweet and Dave Rochlen. Whitey’s daughter Rosie recreated the scene in Lorrin’s Barn: “The barn felt cool to me on the hot summer day. I dug my bare toes through the soft layer of silt and sawdust to feel the hard floor underneath. It was just dirt but so hard it felt like cement. I remembered the first time I went into the barn. It contained an old horse-drawn buggy, cow hides hanging from the rafters and a warm milky smelling calf in the one stall… saw horses, sandpaper, tools, varnish, redwood, assorted diving and fishing paraphernalia and projects in various stages. “The boats, lobster traps, the shop and many of the items needed for commercial fishing, my dad built himself,” Rosie continued. “But most of all he really liked to create just for the fun of it. Lots of the results were a quick fix, but then there was the thirty-eight-foot dugout outrigger. It took him five years to build it. “… He had looked at the old sycamore tree for a long time imagining how the natural bow in it would shape into the perfect surfing canoe much like the ancient Polynesian Koa wood outriggers. The ‘Nofre gang accompanied us with saws, ropes, and chains, everyone ready to lend a hand to bring down the old sycamore for Lorrin. “The sunlight caught on the pale grey trunk with golden brown patches like age spots darkening on the face of a grand old lady. The tree was majestic and slightly leaned off at an angle. It took some doing to bring her down. Then she was revered, covered and cared for while curing for several years. Well, it should have been five years of curing but Lorrin was impatient to begin the work. On poor wave days at San Onofre, when they would rather be playing music, drinking beer and dancing, Daddy would heckle and prod, ‘Oh it will be fun to work on the canoe. We’ll be able to ride waves in it. Let’s do it.’ Everyone did get to use the big sycamore canoe finally. They rode waves in it and dove out of it. Voss and Margret’s daughter, Luana, remembers having to accompany her dad on skin-diving expeditions in the canoe because they could get an extra limit with her along. Sometimes she got pretty bored waiting for them. “We were such an unusual phenomenon. ‘Family of seven travels to Hawaii with four surf boards, fins, and diving gear.’ A lady reporter came to take our pictures for the newspaper and interview us. Meanwhile, Whitey continued fishing. “The fishing industry was always fraught with hazards,” Rosie continued. “Tales of them were most often interesting and amusing. Lorrin was on the Capo pier operating the winch when his jeans, which often were well used and tattered, caught in it and ripped totally off of his body. He was standing there stark naked. Two ladies that had been walking on the pier and had been frozen in their tracks aghast at the incredible scene were now attempting to direct their eyes away. Mid-decade, Whitey “was doing some real interesting experimentation with molds,” recalls Rosie. “He tried making an all-hollow board in a mold just out of fiberglass. I was standing on the cliff at Dana looking down when he took off on a good size wave with the first one of these. As the wave broke on him the board just sort of slid apart like an Oreo cookie. I was embarrassed, but the guys up there watching with me were fascinated. They knew something great was in the works. Groups of those young guys would get together at Hobie’s and spend hours brainstorming on new ways to design and make boards. Going into the 1960s, it became more and more difficult to make a living fishing, “but Lorrin never seemed to be daunted.” For a short while, he even gave a go of lobstering in Ireland, teaching American methods and learning Irish. But, “It was difficult for landowners and farmers to keep their land in California in the ‘60s,” continued Rosie. “The taxes escalated with all the progress and construction. Along with the decline of sea life came new laws every year restricting diving and fishing. My dad and Cecilia struggled along with this for about eight years. When they were approached with an offer to lease the land in front of the house for a trailer court it seemed like a sound idea. So out with the avocados and in with the mobiles. Suddenly they were semi-retired. That afforded Lorrin more time to pursue his passions. On the Saturday after Lorrin “Whitey” Harrison passed away, approximately one hundred friends and family members spread his ashes in the waters off Kawaihae on the Big Island of Hawai‘i. There were also ceremonies held at San Onofre marking the passage of one of surfing’s greats; a man whose positive contributions we benefit from each day we hit the surf. Stecyk, The Surfer’s Journal, Winter 1993-94, p. 42. Gault-Williams, Malcolm. Interview with Wally Froiseth, April 3, 1996. Gault-Williams, Malcolm. Interview with Wally Froiseth, April 3, 1996. Wally offered 1938 as the date; he was still in high school. This was verified by Fran Heath, who had the original receipt for the board that became the first hot curl. See also “Gene ‘Tarzan’ Smith” chapter, this volume. Gault-Williams, Malcolm. Interview with Wally Froiseth, April 3, 1996. See also Gault-Williams, “Surf Drunk, the Wally Froiseth Story,” The Surfer’s Journal, Volume 6, Number 4, Winter 1997. More detail in the Tarzan chapter, this volume. Clark, Let’s Go, Let’s Go! © 1997, p. 24. Surfer, Vol. 35, No. 1, January 1994, p. 30. The Surfer’s Journal, Vol. 1, No. 3. Stecyk, pp. 41-42. Clark, Let’s Go, Let’s Go! © 1997, p. 30. Clark, Let’s Go, Let’s Go! © 1997, pp. 33-34. Clark, Let’s Go, Let’s Go! © 1997, p. 34 and 37. Clark, Let’s Go, Let’s Go! © 1997, p. 37. Noll, Greg. Da Bull, p. 93. Clark, Let’s Go, Let’s Go! © 1997, pp. 66-67. Clark, Let’s Go, Let’s Go! © 1997, pp. 75-76. Clark, Let’s Go, Let’s Go! © 1997, p. 78. Clark, Let’s Go, Let’s Go! © 1997, p. 79. Clark, Let’s Go, Let’s Go! © 1997, p. 86. Clark, Let’s Go, Let’s Go! © 1997, p. 89. Clark, Let’s Go, Let’s Go! © 1997, p. 109. Around 1954. Clark, Let’s Go, Let’s Go! © 1997, p. 115. Clark, Let’s Go, Let’s Go! © 1997, p. 116. Cralle, Trevor. Surfin’ary, ©1990, p. 40. Greg Noll quoted, probably from Da Bull. Clark, Let’s Go, Let’s Go! © 1997, p. 112. Clark, Let’s Go, Let’s Go! © 1997, p. 127. Cralle, 1990, Greg Noll quoted. Clark, Let’s Go, Let’s Go! © 1997, p. 124. Clark, Let’s Go, Let’s Go! © 1997, p. 134. Clark, Let’s Go, Let’s Go! © 1997, pp. 129-130. Clark, Let’s Go, Let’s Go! © 1997, p. 134. Lorrin actually brought home what he thought were fossils from this find, but after testing they were found to be rocks. Clark, Let’s Go, Let’s Go! © 1997, p. 136. Clark, Let’s Go, Let’s Go! © 1997, pp. 136-137. Clark, Let’s Go, Let’s Go! © 1997, p. 153. Surfer, Volume 35, Number 1, January 1994, p. 30. Munoz, Surfing, February 1994, p. 28. Surfing, “Whitey’s Passing,” by Mickey Munoz, February 1994, p. 28. Clark, Let’s Go, Let’s Go! © 1997, p. 160. Gault-Williams, Malcolm. Interview with John “Doc” Ball, January 10, 1998. Whitey was the main guy responsible for bringing outrigger design and craft to Southern California in the 1930s. Muñoz, Mickey. “Whitey’s Passing,” Surfing magazine, February 1994, p. 28. Clark, Let’s Go, Let’s Go! © 1997, p. 144.